An entry-level records management solution you can customize to fit the needs of your business. 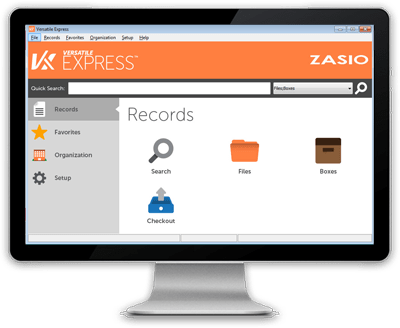 Versatile Express is suited for small companies or a single department and ensures your records are maintained consistently and retained responsibly, by the highest standards. It’s entry-level software solution that replaces chaos with control. Manage physical records simply, right from your desktop! Whether your files are still in use and need to be accessed regularly (“active”) or stored in boxes and put away for eventual disposition (“inactive”), Versatile Express helps you track their location at all times. With Express, records can be associated to departments and assigned to a robust file classification system. Schedule records for physical transfer and destruction and dynamically calculate retention with Versatile Express. Simply assign your record series to a file or box and the system automatically calculates the transfer and destruction dates. circulation of your files and boxes, handles check out requests, and allows you to generate and email “overdue” reports. Create unlimited custom reports for inventory, circulation, and destruction so you only see the data you need. The built-in Report Wizard helps you build a basic report with a few clicks of your mouse. The ability to search is key to having control over your records. Versatile Express includes a full-text search engine that rivals most high-end systems. Search logic including Boolean (and, or, not, like), proximity, phrase, and wild card are all standard features. Minimize data entry with custom screen design. Versatile Express contains standard and user-defined fields and tables to help you. Eliminate the hard-copy circulation process by allowing users to view scanned records. Versatile Express contains a convenient built-in imaging system that allows you to attach electronic files, such as PDF and Word documents, to a file or box. You can even scan images or load from a network or PC. online in less than two hours. Zasio hosts and manages your servers, so you don’t need to worry about troubleshooting issues, we’ll do that for you should something come up. When we release software updates, we can handle the work on our end. Because we’re experts, updates and support can be done with speed and convenience. If a time comes when you need a bigger server, we can simply resize it to fit your needs. Physical firewalls ensure your data is protected. And, an encrypted site-to-site VPN tunnel can be used to manage traffic between your company and the cloud servers. Gather data from one or more source files and import it into your Versatile software. Mapping your data into Versatile is easy with Versatile Import. Save hours of data entry, eliminate errors, create multiple and customized templates, and even format data for consistency. Providing critical notifications to individuals with a need to know is becoming a top priority within the records management industry. Send personalized emails to notify users of events occurring in Versatile. Automatic notifications may be scheduled as a timed job or triggered by virtually any business process. You can rest easy knowing that due dates and important details won’t fall through the cracks. Versatile Fuse extends the reach of Versatile by creating connections to other systems. For example, Fuse can send your approved retention schedule to a document management system so you can apply it to other records. Or, Fuse can publish to middleware to give other subscribing applications easy access to your data. Ready to improve your records and information management program? We’ve got the solution you’re looking for. The best virtual management records toolbox, ideal for small to mid-size businesses. Simplify and improve electronic and legacy records-tracking processes for greater control of your records. Enterprise is designed to meet the records management needs and the information governance challenges of mid- to large-sized businesses. Enterprise has support for complex record structures and a customized user experience.